As shutters become more popular throughout the UK, more people get to recognise the benefits that plantation shutters offer. Gaining superb control of light is one of the most commonly recognised benefits customers find when they have their plantation shutters installed, particularly for light reduction in cinema rooms. This photograph shows plantation shutters with 89mm slats (which equates to 3 ½” shutters slats). They are made from FSC certified yellow poplar sustainable hardwood. The shutters have a regular front facing push rod, which link all the shutter slats together, to open and close the slats in unison. 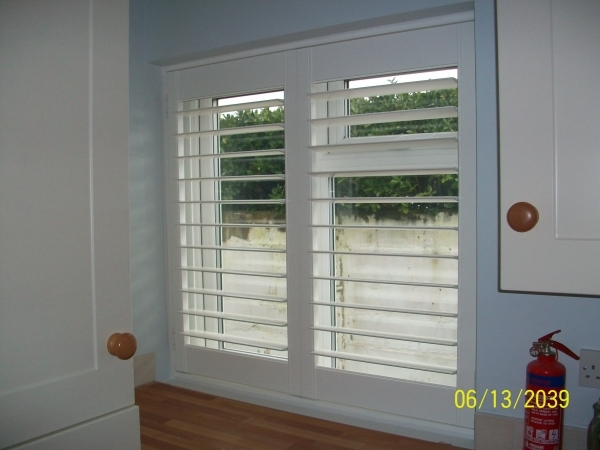 Shutterly Fabulous has many years experience in the design, manufacture and installation of plantation shutters. Getting good design advice is essential to ensure that your plantation shutters meet your individual requirements. Central to this philosophy is making sure that your plantation shutters are installed with the optimum number of panels, for how you intend to use the shutters and the window itself. Many UK shutters customers assume that they will always fold back their plantation shutters panels. However in reality many of our customers find they only tilt the slats for light control. In these instances you’re better to have plantation shutters with wider panels, which reduce the amount of solid wood on the window and allow a good amount of light to filter through the plantation shutters slats. As this photo shows, you get wonderful shadows cast through the shutters slats and still get a clear view from inside the room. Shutterly Fabulous offer expert, no obligation shutter design advice. Contact us to take the first steps to a Shutterly Fabulous home.